Residential thermostats have evolved. Climate control thermostats are providing increased levels of comfort and home energy savings. How many of us ever wished we could simply adjust the heat or air conditioning from the comfort of our cozy bed? Ever wished you could move a mounted home thermostat? What if you could move it to a certain room and at any given time? This would allow for a more accurate control of the climate settings and comfort, when and where its needed the most. Wireless technology is quickly becoming the new standard in so many different aspects of our daily lives. Residential thermostats have become no exception. With wireless thermostats, you can essentially place your thermostat wherever you want. 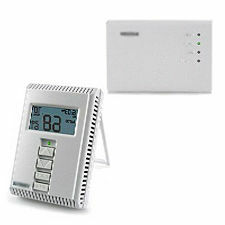 Maintain the right temperature in exactly the right room and at any given time with these climate control thermostats. You can place your thermostat in the dining room during dinner or in the living room during family get-togethers or in a precious newborns bedroom throughout the night. Wireless thermostats use RF or radio frequency to alert a homes heating or cooling systems of temperature changes as well as preprogrammed or scheduled temperature setbacks. Wireless models contain two basic components, the RF receiver and the programmable thermostat itself. The receiver is simply wall mounted and wired. Wiring the receiver is done the same way you would wire a home thermostat. The thermostat itself is a portable and programmable control panel or remote control. This remote control accurately takes temperature as well as alerts a homes heating and cooling system from as far away as 500 feet from the wall mounted receiver. Want even more climate control? Climate control thermostats and the wireless systems that power them can be even more effective. Some models can control the temperature in several areas or zones throughout a house. However it's important to note that alterations would have to be made to a homes central heating and cooling systems in most cases. For those homes with central heating and cooling systems some wireless thermostats allow for multiple remote controls that can be mounted in several areas, allowing for easy access to central climate control settings. Some companies and utility providers allow homeowners to control their setting or override temperature setbacks all from a secure and personal website. It's also important to note that in these cases the wireless thermostat usually has to be purchased from the utility provider or a particular manufacture. the receiver replaces your old residential thermostat. how to choose the best programmable thermostat for your home.